The eyes are simple, and resemble the ocelli of insects. Most spiders have 8 eyes; Some lineages have lost some or all their eyes, ergo there are spiders with 8,6,4,2, or one or none. The size and positions of the eyes is widely variable. Many of the hunting spiders, e.g. 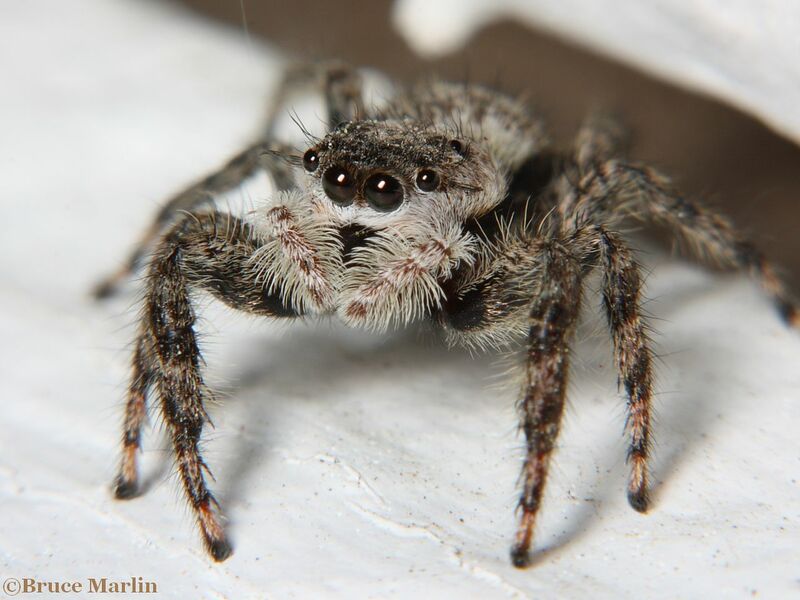 Salticidae (jumping spiders) and Lycosidae (wolf spiders) have large, forward-facing eyes and keen vision required for their craft; many of these spiders have at the back of the eye a reflective membrane called a tapetum . It is this surface that aids in night vision and causes their eyes to reflect light and shine in the dark, like a cat’s eyes. Most sedentary spiders have relied on their sense of touch for so long their vision is thought to be poor. Orb Weavers – Family Araneidae is a huge group of spiders with 3500 species worldwide, 180 of which call North America home. These spiders vary greatly in color, shape and size, measuring between 2 – 30mm (1/16 — 1 1/4″) long. Males are generally much smaller than females. Most orb weavers spin spiraling webs on support lines that radiate outward from the center; the plane of the web may be vertical or horizontal or somewhere in between. Many orb webs are built on human structures, parallel to walls. Orb webs are the result of millions of years of evolution; spider silk is many times lighter and stronger than steel, and the geometrical architecture could not be more economical or efficient. Below the carapace, on the bottom of the cephalothorax, is a heart-shaped plate, the sternum. In front of that is a smaller lip, or labium, which forms the bottom of the mouth. The coxae of the legs and pedipalpi are arranged radially around the sternum. In most spiders, the coxa of the pedipalp is fitted with an enlarged, sharp plate, the maxilla or endite, which helps the spider dismantle its prey. Directly underneath the carapace at the front are two chelicerae, or jaws, which are the deadly weapons wielded by these predators. Each chelicerae is tipped with a fang – the venom delivery vehicle that works roughly like a hypodermic syringe. The fangs are stored in a groove in the base of the chelicerae when not in use. All spiders are predacious and carnivorous. They subsist on the bodily fluids and chewed up live insects they have paralyzed with their venom. Their method of feeding is pretty much the same as ours, except their “teeth” and digestive processes are external. The strong chelicerae and the sharp edges of the endites are used to crush and pulverize the prey, all the while bathing the resultant wreckage in copious quantities of digestive fluid from the maxillary glands. The resultant broth is vacuumed up through the mouth and esophagus by means of powerful muscles that cause expansion of the stomach and gut. It is thought spiders do not ingest solid food, but only predigested liquids. Some hard-bodied insects like beetles are injected with digestive juice through a small hole, and the whole outer cuticle is discarded afterwards. Furrow Spider – Larinioides cornutus mature female = 12mm. Commonly called the furrow or foliate spider, this orb-weaver is very common on human structures, especially under eaves and porches. 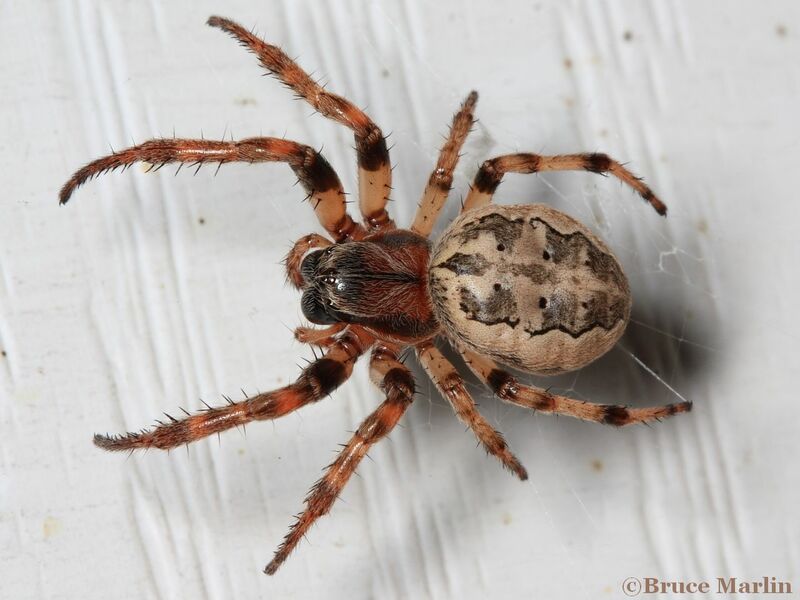 They live on my back porch by the dozens, males and females alike in their smallish-orb webs, woven just a couple inches from and parallel to the wall. Unlike their larger sisters amongst the weeds, these beautiful little rascals are strictly nocturnal, hiding in crevices or in foliage retreats from dawn till dusk. Lynx Spiders – Family Oxyopidae are diurnal, that is, they hunt during daylight hours. Their hunts are conducted much like those of their namesake; they roam the foliage looking for prey. 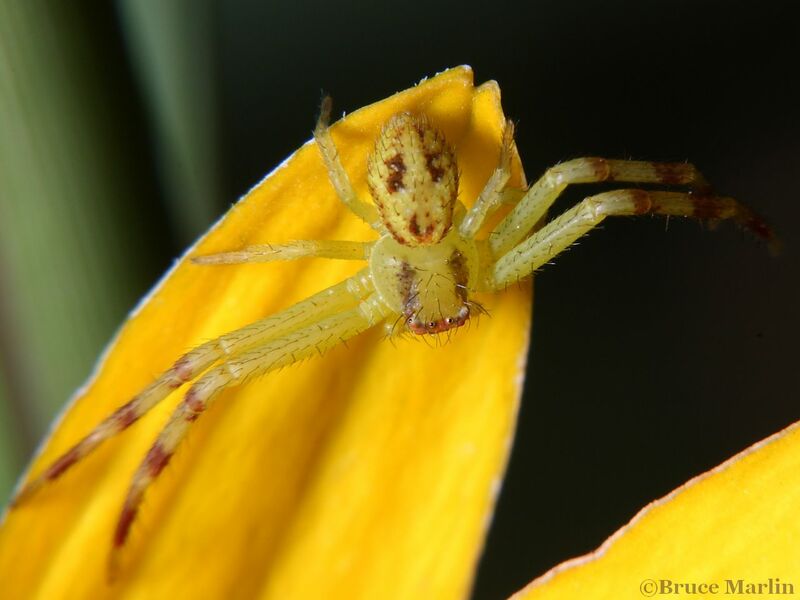 Their eyesight is not as keen as the jumping spiders, and they more often use the “wait and pounce” hunting tactic most often associated with the (equally well) camouflaged crab spiders,Thomisidae. 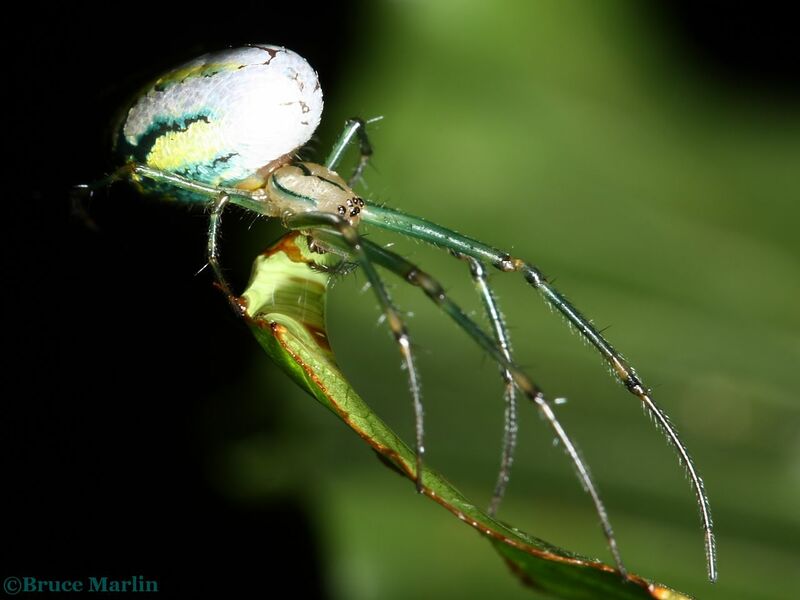 Studies have shown the green lynx spider to prey on many species of insect, with insects in the Order Hymenoptera being the most common, comprising over 40% of all captures. Diptera (true flies) accounted for fully 15% of all prey. It must be kept in mind, as well, that spiders serve as food for many other types of organisms, principally birds. This small (5mm) wolf spider was constructing a sort of scaffolding web encasing several flowers, upon which she can rapidly attack any prey that happen to blunder into range. She also had zip lines to other plants nearby – she had the whole neighborhood rigged! It may look like she’s floating in midair, but she’s standing on that web. I’ve seen orbweavers build the same kind of disorganized looking web strictly for moving around their environs easily and quickly – increasing the space they can hunt. I believe a spider’s hunting behavior is at least as complex as any of the large mammalian predators. Nursery Web and Fishing Spiders (Family Pisauridae) superficially resemble wolf spiders. Most spiders in this family have their eyes arranged in two rows, with the front row in a straight line of four, the second row curved in a u-shape. These spiders do not build webs to catch prey, but use silk to construct a special nest or nursery web. 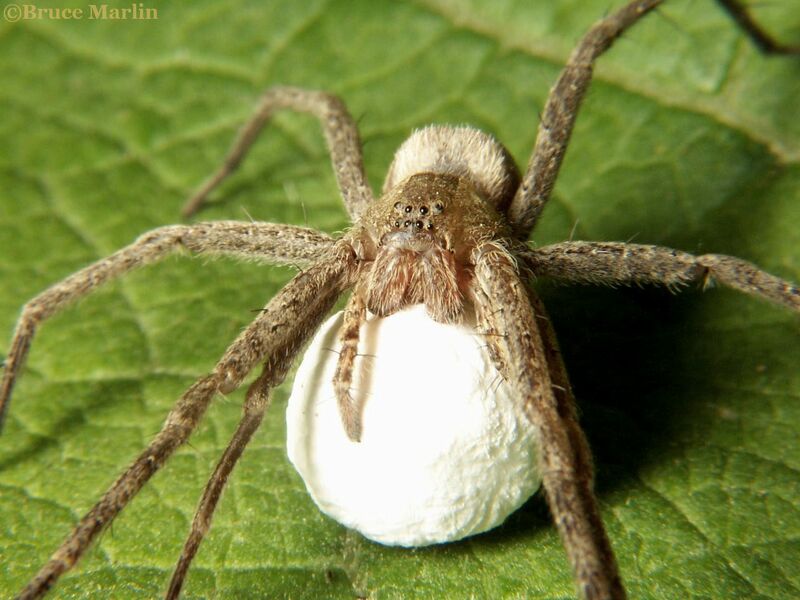 The female carries a spherical egg sac around until the eggs are ready to hatch, then constructs a web and places the egg sac inside. She then stands guard nearby until the spiderlings have all grown and dispersed. Some of the largest spiders in this family, the fishing spiders, run over the surface of ponds and streams, and sometimes even go under water. They may capture tadpoles and small fishes near the surface, but mostly prey on insects. Funnel web weavers (Family Agelenidae) are often found in grassy fields, low shrubbery, or living among leaf litter in forests. They spin sheet webs of nonsticky silk with a characteristic funnel extending off to one side. 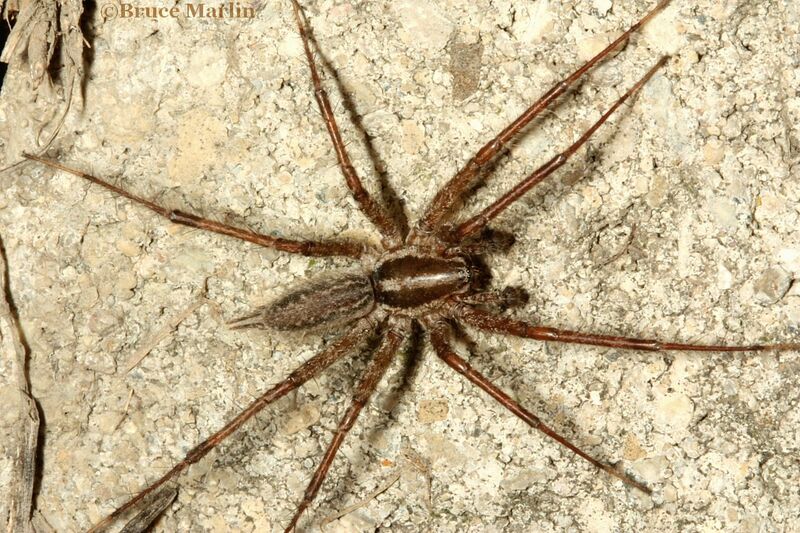 The so-called Hobo spider (Tegenaria agrestis) is a member of this family. The hobo has been expanding its range since its introduction (from Europe) into Washington state in the 1930s. It has been implicated as a spider of ‘medical importance’ as studies indicated the hobo spider bite caused necrotic lesions either through the actions of hemolytic venom, or the introduction of pathogenic bacteria into the wound. However, a 2009 study conducted on T. agrestis spiders collected around homes in Washington state revealed no hemolytic aspects of the venom, and no bacteria other than those routinely found in soil, in the air, or even on human skin. 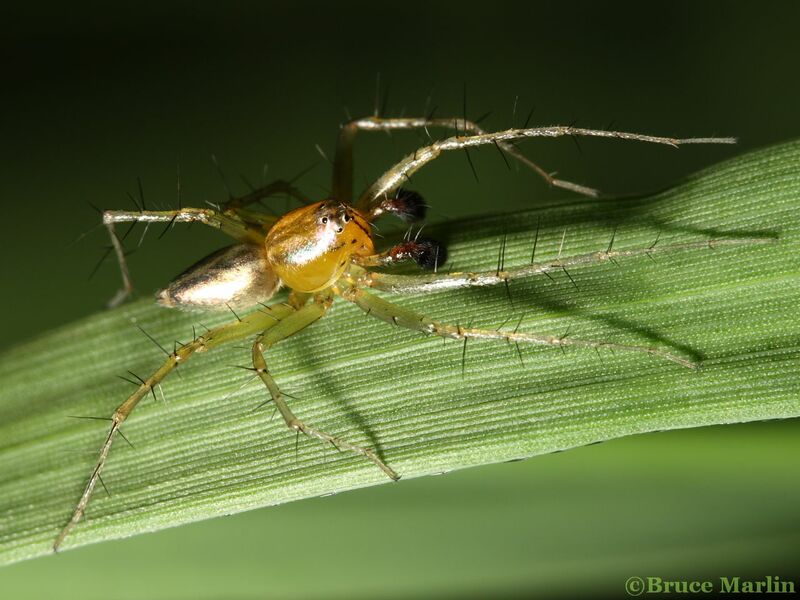 Family Tetragnathidae – Long-Jawed Orb Weavers are usually easy to identify by their eponymous huge, powerful chelicerae (jaws) and long, slender abdomen. Like the other family of orb weavers, the Araneidae, these spiders have eight eyes and 3 claws on each tarsus. There are about 25 species in North America. The Venusta Orchard spider, (above) a very common woodland arachnid, is a member of this family. The Venusta (after Venus, the goddess of beauty) spider is nearly ubiquitous in the forest understory here in northern Illinois where they sit upside down in their smallish (6-8 inches or so) horizontal orb webs. Their chelicerae are not nearly so prominent as other spiders in this family. Crab spiders (Family Thomisidae) hold their legs outstretched to the sides, in the manner of their crustacean namesake. They have short, broad bodies and 8 small eyes sometimes located on raised bumps. The second pair of legs is often much heavier and longer than the third and fourth pairs. 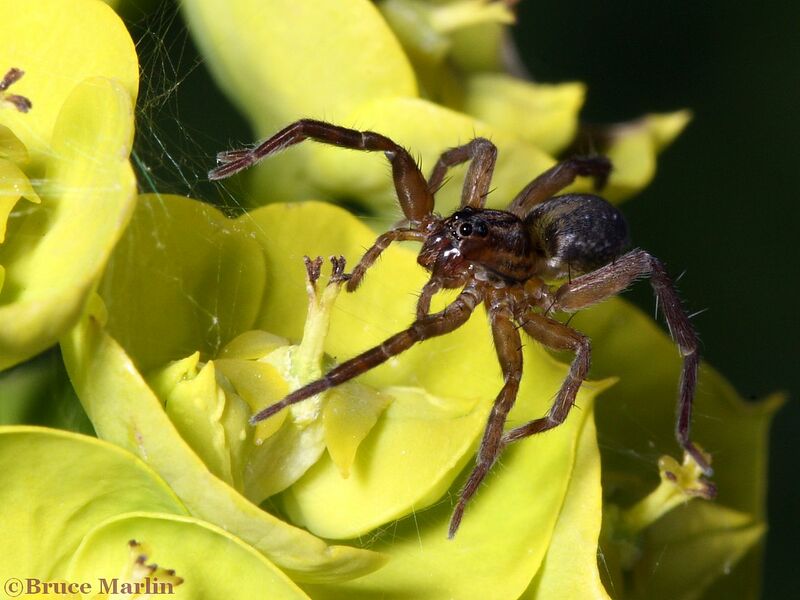 Crab spiders do not build any sort of web, they prowl the ground and climb flowers and plants in search of prey. Many are masters of camouflage and simply await their prey on flowers, much like ambush bugs. Their prey includes butterflies, flies, beetles, bugs – just about any insect that blunders within range. 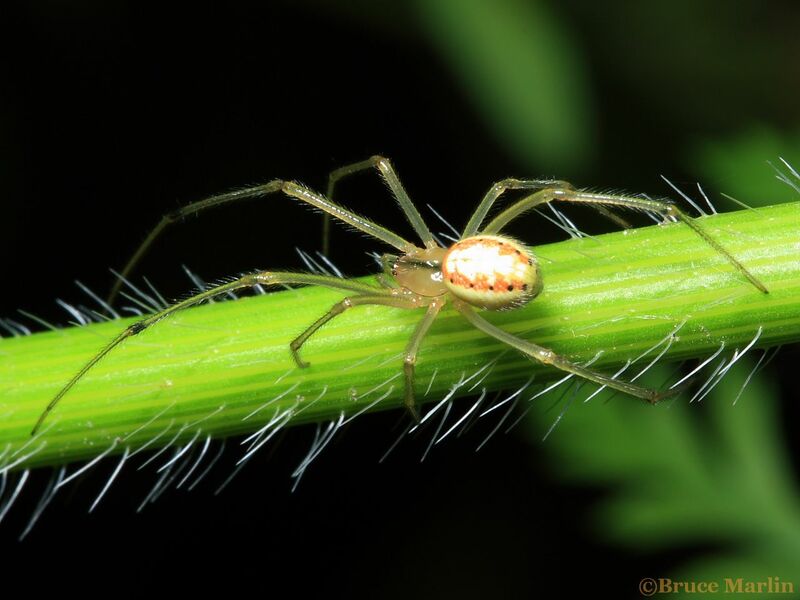 Cobweb spiders (Family Theridiidae) are also called comb-footed spiders, after the inconspicuous comb-like bristles on the hind tarsi of many species. These spiders spin irregular webs (cobwebs) and use their combs to fling silk over any prey that gets caught in the web. Thus swathed, the victim is then hauled to a rest site, injected with venom, and later eaten. There are more than 200 North American species in this family which includes the black widow spider. Linyphiidae is the second largest family of spiders after Salticidae. Comprised of 4,300 described species in 578 genera, this family is poorly known because of their small size. Commonly called sheetweb spiders (subfamily Linyphiinae) and dwarf spiders (subfamily Erigoninae). Sheetweb spiderwebs can be flat, convex or concave, or can simply hug the substrate contours, as this spider demonstrates. She has constructed her web on a fallen log, drenched in condensation on the forest floor – an environment not particularly conducive to the rapid movement she needs to capture prey. So instead of mucking about in the moss and lichens and liquid, this spider is supported on silken strands she grips with claws at the tips of her legs. This gives her the advantage of speed, and also imparts a network whereby prey movements are communicated almost instantly to her vibration-sensing equipment. Lone Star Tick. According to the Center for Disease Control, the lone star tick is a concern, but not for Lyme disease. American Dog Tick. The American dog tick is the largest of the eastern wood ticks. Ticks are parasites, and American dog ticks are known as “three host” ticks because they use three different hosts during their development. Blacklegged Tick or Deer Tick. According to the Centers for Disease Control, Lyme disease is now the most common vector-borne infection in humans in the United States. Velvet mites are critically important to soil replenishment and sanitation, preying on tiny insects that feed on bacteria and fungi that live in the soil and whose remains constitute a large volume of same. Completely harmless, but big and black and hairy, this common indoor spider can startle the best of us. Often live in dark, undisturbed places like basements and attics. They are small-bodied spiders with very long, thin legs. Many are capable of “vibrating” their way to invisibility; you can see a video of this process here. Tiny spiders in this family are all under 5mm long, most are in the 2-3mm range. There are approximately 290 species in 20 genera. These are very common spiders that frequently live in human dwellings – they are likely culprits when you find cobwebs in the corners of your ceilings. Pictures of spiders that are probably living in your house right now.